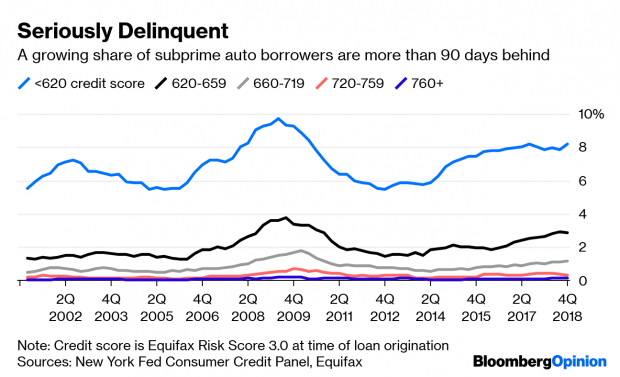 It’s not even as if FICO pretends to be a perfect reflection of a borrower’s creditworthiness. In the fixed-income world, nothing gets investors’ attention quite like the idea of “grade inflation.” After all, certain widely accepted, easy-to-understand scores from credit rating companies still hold huge sway over the global market for debt, even though they were partially to blame for the financial crisis. So it’s little wonder, then, that this article from Bloomberg News’s Adam Tempkin drew a lot of interested bond traders: “Inflated Credit Scores Leave Investors in the Dark on Real Risks.” In it, analysts from Goldman Sachs Group Inc. and Moody’s Analytics argue that FICO credit scores from Fair Isaac Corp. have been artificially inflated over the past decade and don’t reflect borrowers’ true ability to pay what they owe in the event of a downturn.